The Layout section of the toolpart allows you to set various configuration options that apply the the whole web part. Normally FilterPoint displays an "Filter" button to apply the currently selected filter once a user has made their selection. You can set filters to Automatically Update using the main configuration in which case you may want to hide the Filter button. Be sure to set all your filters to automatically update though - otherwise the user will have no way of applying their filter selections! 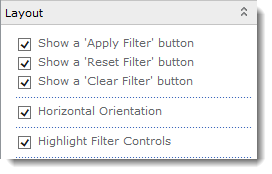 A "Reset Filter" button will reset all the filters to their default values. You can also show a "Clear Filter" button that will remove any currently applied filters. By default FilterPoint lays out multiple filters horizontally as this better fits in with most web part pages. You an optionally lay out the filters vertically. By default FilterPoint is highlighted with a blue gradient background - you can remove this and use a plain white background instead.